last year in Malibu Creek State park. This year the event will be held on Saturday Oct. 3. On July 28th, the governor signed a revised Fiscal Year 2009-2010 state budget, based on the package of bills sent to him by the legislature on July 24. In using his blue-pencil veto authority, the governor exacted an additional $6.2 million cut to the state park system, bringing the total General Fund cut to $14.2 million. It is expected (and referenced in the Governor's budget summary) that more than 100 state parks will be closed. This represents more than one third of California state parks. A list of parks to be closed is not expected until Labor Day. The extra $6.2 million taken from state parks was part of approximately $500 million the governor struck from the budget after it had been passed by the legislature. More news on this issue: State parks are looking for sponsors to help keep the parks open. Read the story from the Los Angeles Times. For timely updates on the situation with our state parks, visit the California State Parks Foundation budget update web page. Take Action! Send a message in support of keeping the parks open to your state representatives using this online form. It will only take a minute or two of your time. Less than 3 months until CORBA’s Fat Tire Fest – the biggest MTB event in Southern California! Get ready for awesome advanced, intermediate, and beginner rides. New kids’ rides and events. Bring the whole family. Ride, Eat, Win! June 6 - National Trails Day at Portuguese Bend Nature Reserve in Rancho Palos Verdes. CORBA's Palos Verdes committee and REI cosponsored the June 6 National Trails Day event in the Portuguese Bend Nature Reserve. The trail workday attracted 71 volunteers. Mountain bicyclists made up 20 percent of this great turnout. Volunteers cleared weeds and nonnative plants from two long singletrack sections that were narrowed from the overgrowth. Bicyclists also removed about 20 feet of rusted pipe, which was a former cattle barrier. The pipe had been overhanging the trail at eye level for decades. Volunteers also enjoyed lots of morning goodies and coffee, as well as a lunch after their toils. Take A Kid Mountain Biking Day - Saturday October 3. 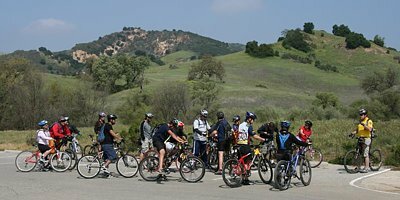 In conjunction with the IMBA's Take a Kid Mountain Biking Day event, CORBA will be having a fun ride at Malibu Creek State Park at 9:00 am. The ride will be followed by a barbecue. Kids must have their own bikes and helmets. All ages are welcome! If your Kids are too young to ride, feel free to bring a bike trailer or trail-a-bike and tow them along. These can be your own kids, nieces, nephews, friends kids, neighbor's kids... There will be a few different ride options for different age groups. Feel free to participate even if you don't have any kids to bring. Childhood obesity in the United States has reached an all-time high. Experts say that the current generation of U.S. children could actually have a shorter life expectancy than their parents. IMBA and CORBA believe mountain biking can help reverse this trend. We need your help to get kids back on bikes. Please RSVP to Hans at danusia@corbamtb.com if you plan on attending. Not sure how much your kids will love this? You can view photos from the 2008 event in our photos gallery. Last week the Law Enforcement Rangers, Los Angeles County Sheriff's Dept., CA State Parks and CAMP eradicated three different marijuana cultivation sites. Two of the sites were on State Park lands and one was on NPS lands in the Zuma/Trancus area. A total of 3,509 plants were pulled. All of the fertilizer and rodenticide was removed. Unfortunately, there was a lot of trash and debris in the sites that could not be removed. Rangers will attempt to go back and clean up the site at a later date. The cultivation season is from April through November. During this time, don't hike or ride alone. Please avoid hiking off trail. Bring a radio or phone with you. Make sure someone knows where you are going to hike/ride. If it doesn’t seem safe, leave the area. Here are some warning signs to watch for. Old stands of chaparral with well traveled trails that don’t seem to go anywhere. Drip irrigation lines leading from streams into brush. Unusual trash: piles of seedling cartons, food cartons, drinking water containers, sleeping bags, tents, propane tanks. Hikers in camouflage who seem unusual (without the usual hiking gear), walking along road sides or off trail. The same vehicle often parked at roadside pull outs, especially at dawn or dusk. Duffel bags of food or supplies left at roadside pull outs. If you come across something off trail that seems suspicious, report the trail and GPS coordinates (if you have them). If you notice a suspicious vehicle, jot down the make and license number. Call the info into Angeles Dispatch 661 723-3620. This is a difficult problem to deal with. Be assured the safety of our park visitors is a priority. Saturday August 1 is the next skills clinic.